In Addition To "NEWAY" Standard Package, We Can Produce 60 LEDs/M Waterproof LED Flexible Strip 3528 Kit Package Following Your Requirements. In Addition To DC 12V or DC 24V Low Voltage LED Flexible Strip. 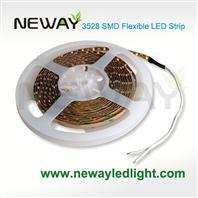 We Can Produce AC 220V or AC 110V High Voltage LED Flexible Strip. Normally, Ours AC220V or AC110V High Voltage LED Flexible Strip Length 100 Meters Per Reel,30 LEDs Per Meter or 60 LEDs Per Meter, With Super Bright SMD LED 3528 or 5050 Chips. And We also produce AC 220V High Voltage RGB Multi-Colour LED Flexible Strip. The Differences Between Low Voltage LED Flexible Strip and High Voltage LED Flexible Strip. High Voltage LED Flexible Strip Max Length 100 Meters, Save Manpower and Installation Cost. 60 LEDs/M Waterproof LED Flexible Strip 3528 Is Used To Direct Replacement Of Traditional Flexible Strip and MINI Incandescent Decorative Light Bulbs, Also Is Applicable To Building Decorative Lighting, Edge Lighting Decoration, Corridor Lighting, Stair Lighting, Concealed Lighting, Backlighting Advertising, Signage Lighting, Furniture Decorative Lighting, Underwater Engineering Lighting and Other Indoor and Outdoor Decorative Lighting.